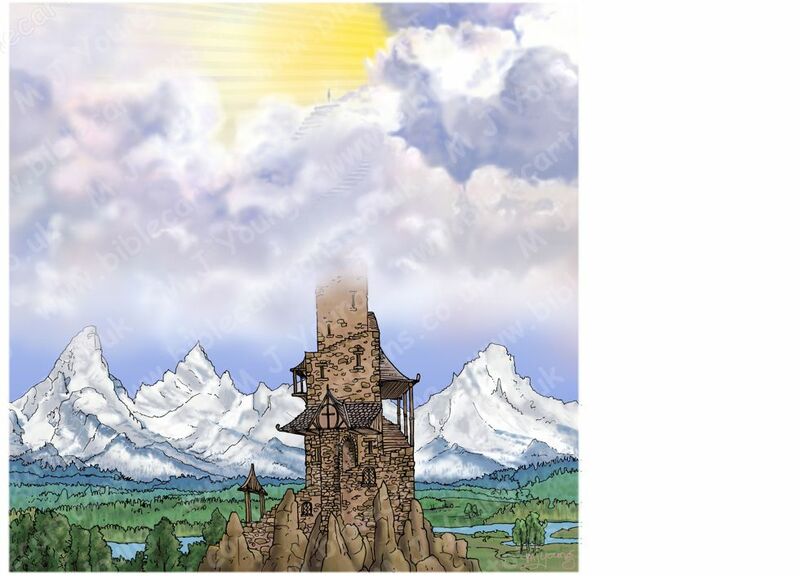 Bible Cartoons: Tower and Heaven imagination/vision story - Is this from God?! I “saw” this scene in my imagination a few days ago. I think it is a vision picture from the Lord God, referring to life on earth and our focus of attention. As you can see above, I have drawn two versions of this scene. In my imagination/vision the background was almost non-existent, which the Pale version tries to show. I decided to add the Colour version for viewers who might be interested in seeing more colour and detail in the scene, particularly in the background and tower, even though that is a departure from what I “saw” in my imagination/vision. I was aware of a little figure appearing in the bottom left of the scene, running over landscape, towards the tower. The figure reached the tower and starting to run up the steps around the tower’s outer walls. I “knew” the figure was thinking about their life and what was happening to them at the moment. As the figure ran upwards, they became aware of the clouds up above them, and that God/Jesus was up there. The figure ran on, spiralling around the tower, as it disappeared into the clouds, wanting to get closer to God/Jesus. There was a moment when the figure was aware that they could no long be sure of what they were running on – stone steps, or insubstantial cloud steps. In that moment the figure realised that if they focussed their attention on God/Jesus, then He would support them, and they needn’t be concerned or worried about whether or not the surface they were running on was solid stone or vaporous cloud: since God/Jesus was utterly reliable and would support their upward efforts. By taking their “eyes” off the tower (representing the physical world we all live in, with it’s hardships, uncertainty and distractions) and focussing on God/Jesus, the figure could laugh, simply trust in the love of God/Jesus, and run on. The figure did that, and quickly ran to the top of the cloud steps, where they saw a wonderful, breath-taking view of the clouds and bright sunlight. They had arrived in the presence of God/Jesus. I believe the tower in my imagination/vision represents the life we lead here on earth. It is apparently solid, dependable, physical, knowable. 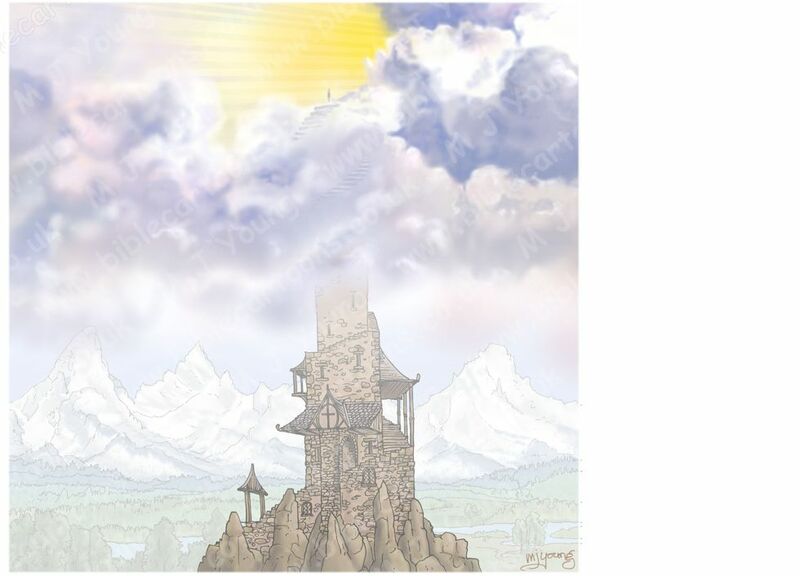 The figure in my imagination/vision was running on the steps that lined the outer walls of the tower, and lead upwards towards the clouds. I think the clouds represent the future we all face as we go through life, with all its uncertainties. The top of the clouds represents heaven and the kingdom of God/Jesus. It is the target or goal of the running figure, to reach there. The figure wanted to get closer to God – that was a strong desire I picked up in the imagination/vision. 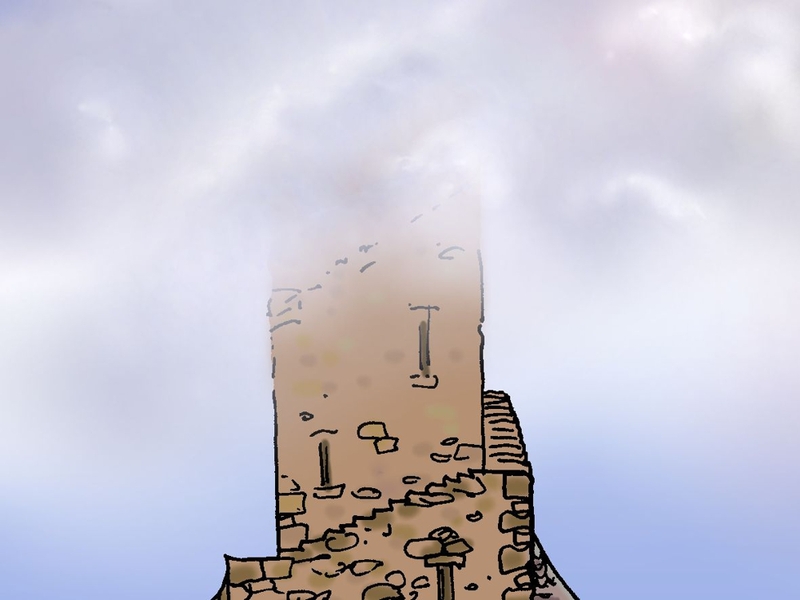 As the figure climbed higher and higher, he or she realised that they would soon be entering the cloud, and wouldn’t be able to see the stone steps of the tower any more. In fact, they “knew” (as you do in these dreams/imaginings/visions!) that they would no longer be walking ON stone steps, but would be walking on the thin, insubstantial cloud steps that were up above them. 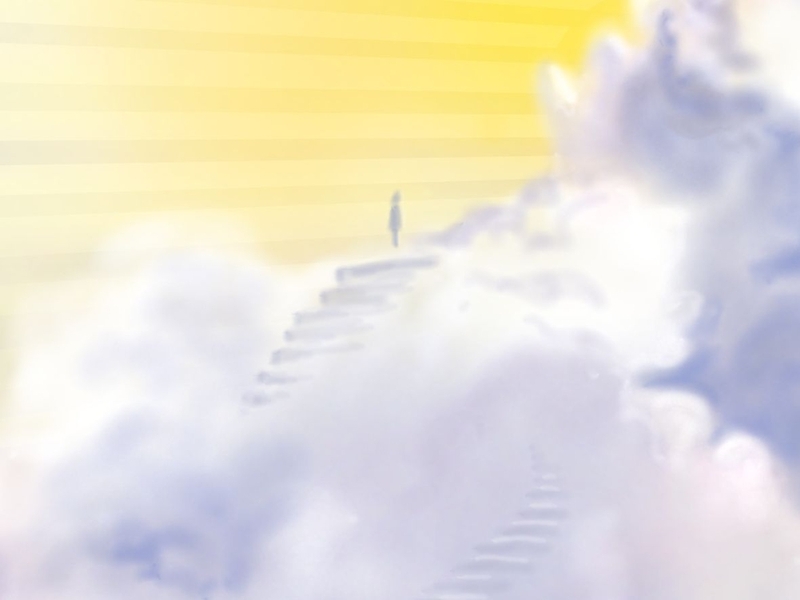 In that instant, the figure “knew” that if he or she focussed their attention on God/Jesus, that they would be alright: they would be able to climb up on the cloud steps in perfect safety, just as if they were as solid as the stone ones had been. The key to a successful ascent lay in KEEPING THEIR FOCUS AND ATTENTION ON GOD/JESUS. That idea seemed very, very important in my imagination/vision story. There was an elation and a sense of joy as the figure transitioned from stone to cloud steps and continued to ascend. The focus on God/Jesus had the double benefit of simply being “right” anyway, and produced joy, satisfaction and a sense of belonging, but also allowed the figure to physically make the ascent on the clouds and head upwards as well. A note for those concerned about using our imagination. These two pictures are my attempt to show what I saw recently in my imagination. I’m sure there are Christians who might be a bit concerned about “listening” to our imagination, in case we are led astray by it. That thought has occurred to me too. However, I believe a Christian’s imagination (which has been sanctified by God, along with the rest of him or her) can be used by the Lord to communicate with them. Of course we have to be careful to ensure we only pay attention to what the Lord is saying to us, and ignoring what our flesh, or the world, or the Devil might be saying! How do you tell where the “message” or image has come from? I think we can be quietly confident of the source and integrity of the picture we have in our imaginations, by comparing the “message” to the Bible’s message. We know quite a lot about the nature of God and what He stands for. If our imagination produces a scene or story which aligns with the purpose and nature of God, then I believe we should accept the image or picture as being from God. On the other hand, if the picture in our imagination/vision is contrary to what we know about God and His nature, then we can simply reject the image and forget about it. I believe my imagination is a great gift to me from God, and that He uses it frequently to communicate with me. But if I “receive” an image or story which I know is contrary to God and His nature (as revealed in the Bible), then I know that I can ignore the “message” altogether. God will always be true to His nature (loving, kind, for us and not against us) and His pictures (in our imaginations) will always be true to that nature. By comparing an imagined scene to what we know about God we can be confident in the source of any image or story we receive. And as I stated above, if an image in our imagination aligns with the message of Bible, then we can be sure of the source of the picture, and it is right to act upon it. For me, I think the tower and heaven story does align with the Bible.